New intelligence on the elusive Yuban comes our way today. We get our tickets for the train ride to Santa Clara after stopping to drop off some art supplies at the studio of a Cuban artist known by the nickname Choco. He isn’t there, delayed in returning from Guadalupe, where he was visiting his daughter, we are told. 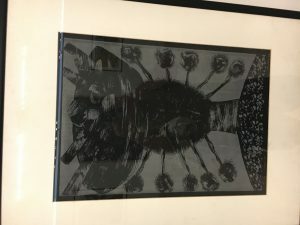 We’re given a tour of the studio and discuss his work in collagraphy, a type of printmaking using heavily textured plates. A revelation comes at the end when I’m given a pamphlet from an exhibition at the University of Missouri two years ago. The first item in Choco’s exhibition is an orisha, a spiritual being in Santeria, the religious practice that emerged from mix of Yoruba slaves brought to Cuba and Spanish Catholicism. Yuban, meanwhile, was a brand of freeze-dried coffee in the 1970s that had nothing to do with Cuba… So, noted. Choco was among the first wave of artists to study at Havana’s National School of Art, established by Castro after the 1959 revolution. He credits the school with saving him. “It picked me up, a little country boy and taught me art,” he told the university. Choco’s early work celebrated rural life and became associated with the black consciousness movement. His status as an Afro-Cuban born in 1949 in the far-eastern port city of Santiago gave him both an insider and outsider’s view of Cuban life, the pamphlet tells me. The next day, we stop again and Choco, still strong and imposing despite his 70-plus years, arrives a few minutes later, pulling two large objects out of his car. He says they are car tires, stuffed with supplies and wrapped in plastic, creative packing techniques learned during travels to Japan. Choco asks how we heard of him and Sarge mentions an exhibition he attended in Baltimore. I suggest that despite the difficulties in getting supplies in Cuba, the lower cost of living allows artists to be creative without as much pressure to make money. “Yes, but first you have to be able to eat,” he says, noting there are places in Africa where hunger prevents people from doing anything but look for their next meal. We explain we’re taking the train east and that prompts chuckles all around, with suggestions we could spend all night stuck somewhere along the way. I say it’s more about the adventure and they all agree we are in for one.